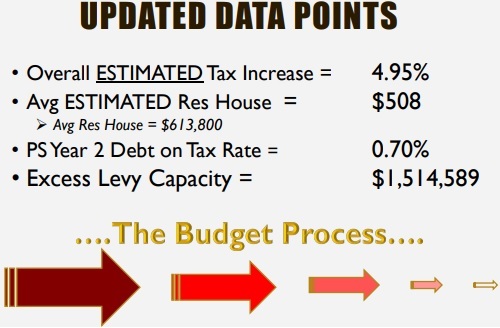 Finance is now predicting that, if approved by voters, the budget would lead to a 4.95% increase in taxes. That’s after the board agreed to support increased funding to Southborough Youth and Family Services. While that increase may sound bad to many of you, it’s better than the previous estimate of over 6% without the support SYFS said it needed. The change isn’t based on the Regional Schools budget. (The Town had hoped that would come down.) In fact that estimate increased by $116K, but may be revised again based on the Governor’s Budge Proposal. Instead, the lowered figures appear to be partly the result of recalculating the estimated short term debt interest. Advisory Chair Kathy Cook previewed that final numbers presented to Town Meeting voters may be even lower. Her committee is looking at ways to reduce costs to the budget and/or capital plan. Once they agree on a vision, they’ll reach out to the Board of Selectmen to talk it through. Prior to Treasurer Brian Ballantine’s FY20 budget update, he addressed the SYFS budget request. Last month the board was split on increasing full time staffing for SYFS. Members Brian Shea and Dan Kolenda had argued that the department had been underfunded for too long. Chair Lisa Braccio and member Bonnie Phaneuf had both worried about increasing residents’ tax burden. They wanted to find a way to improve SYFS staffing without adding a benefited position. Between meetings, the administration came to a compromise agreement with Family Services. It was based in part on changes in the Zoning Board of Appeals personnel. With a reduction in ZBA staff hours, the Town was able to upgrade an SYFS employee to full time status for 40 of 52 weeks without increasing the number of employees on the benefits plan. Ballantine indicated that the administration will also support adding part time staff the following year, as outlined in SYFS’ 5 year plan. Braccio said that between the changed FTE status and looking at other Youth and Family Services departments across the state, she fully supported the change. Phaneuf expressed gratitude that the department had worked hard to come up with a plan that works. Kolenda was concerned that the revised budget may not be enough. He asked SYFS Director Sarah Cassell about her department’s staffing needs. Cassell reassured that the plan in place makes sense for them. She said that a gradual change in staffing and funding, as laid out in their 5 year plan, will be an easier transition to handle than a sudden increase would. As for hours where the SYFS office is empty, Cassell said that her staff has Town funded cell phones that allow them to check in regularly. She also said that seniors who provided some administrative support through the Tax work off program have continued to volunteer after their hours were completed. Cassell hopes that through their five year plan, the department will be eventually able to move from just putting out fires to doing more prevention work. Kolenda asked her to check back in with selectmen during the year. If she finds they are still struggling from being underfunded, he wants to get started early on their next year’s budget. In other financial news, voters won’t be asked to approve borrowing $120,000 for a field design plan at Choate Field. (That’s the baseball and soccer fields in front of Woodward School). According to Town Administrator Mark Purple, the Recreation Commission voted to pull that Article from this year’s Warrant. We should learn more about the Community Preservation Act Articles on this year’s Warrant at next Tuesday’s BOS Meeting, February 5th. Purple told the board that the CPC hadn’t finalized their asks yet. They will be voting on those at their meeting this Monday, February 4th. Funding applications listed on their agenda are for the Library, Historical Society, and Open Space Preservation Commission. As for other articles on the Warrant, I still haven’t had a chance to watch the full meeting from Tuesday night. (Selectmen had invited Article sponsors to present this week before the board voted on their positions.) So, stay tuned for more updates on the upcoming Annual Town Meeting.